Dots and stripes are a fashion and interiors look that never goes out of style. Here’s our cream of the crop for dots and stripes for the hippest pups leading the fashion pack. 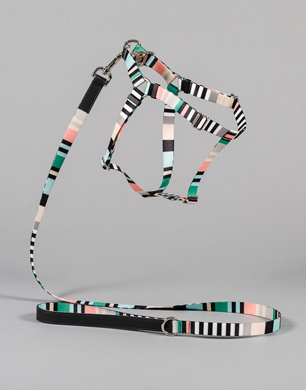 Tough tuggers will love leading the walk in this standout harness from New Yorker pet trend makers Ware of the Dog. Made in a printed polyester webbing for a lightweight feel, this cool multi stripe harness can be adjusted in 5 places for the perfect fit. 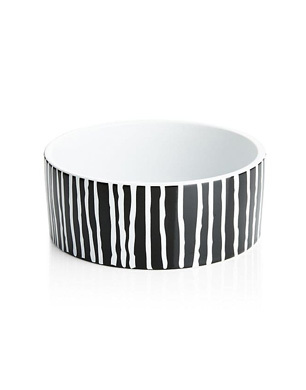 This ceramic monochrome dog bowl is a fashionable piece that won’t offend at meal times. Practical to boot, the bowl is dishwasher compatible and you can pair with the collection’s larger spotted bowl and treat jar for a cool contrast look. 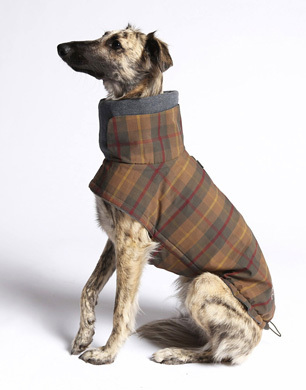 Straying beyond the traditional lined pattern but definitely earning its stripes, as a must have pet purchase is this water-resistant tartan dog coat. Lined in soft fleece for a cosy canine cocoon, it has a velcro fastening belly strap and drawstring hem to stop winter drafts creeping in. It’s machine washable too, which is great news for all those high rollers. A definite investment piece for your dog for winters to come. Be on point when stepping out in this navy and white polka dot number. Lightweight and foldable, it’s perfect for keeping in your bag or for taking on trips to avoid getting caught in the rain. The neon yellow on drawstring hood gives this jacket a cool urban edge. 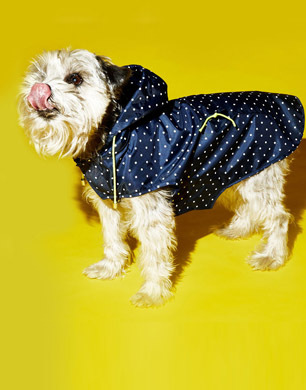 With velcro fastening for ease, this striking rain coat comes complete with a zipper pocket for emergency poo bags and treat stashes. 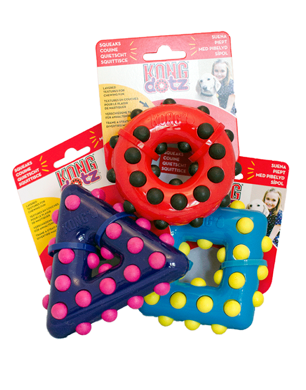 Dogs are dotty for Kong toys and this Dotz product will not disappoint with its variety of chewing fun and layered textures to tempt and tease. The unpredictable bounce of the toy is designed to excite and amuse your dog, while the ‘dot’ nubs will help clean your pup’s teeth and gums. Available in a choice of sizes, shapes and colours. 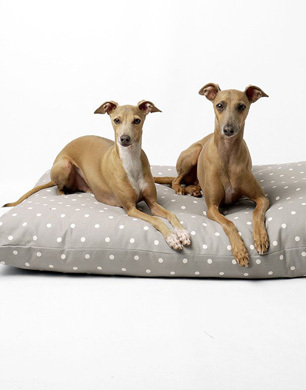 Bringing dots to your dog’s dwellings is this classic mattress style bed from luxury dog bed makers Charley Chau. Perfect for lazy lolling around the house, they’re light and easy to move around from room to room so you can dog can follow you round. Well designed, the day bed is deep-filled and constructed with internal wall channels to stop the fibre filling moving around so it won’t get lumpy, it’ll just stay comfy. Both the outer and inner are machine washable so your dog’s polka dot snooze pad will always stay pristine. Shown in Dotty Dove Grey, it comes in a choice of four sizes and six colourways. 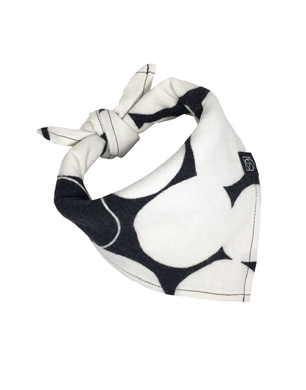 Ensuring your dog is ready for festive soirees at a moment’s notice is this standout, large spotted, monochrome bandana from new pet brand The Stately Hound. For that luxe touch, it’s made from premium Enshuku cotton fabric, that has been created using the Japanese salt shrinking technique for a similar feel to seersucker and is finished with a logo-stamped leather label. 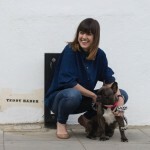 Your dog will definitely be top dog at the party in this chic and eye catching piece. 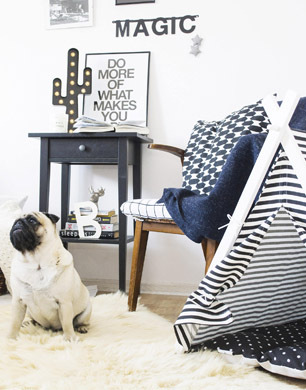 Most dogs enjoy having their own private place to crash where they can escape the buzz of the home, and with its cool stripes and dots monochrome combo, we think this Teepee Tent is a cool hound hideaway. Handmade to order, each teepee is crafted using sturdy premium fabric, natural wood and eco-friendly fibre, with the components including a white pine frame, teepee cover, sleeping mat and assembly instructions – just don’t ask the dog to help! For every order made, the brand pays forward with a portion of the sales donated to a Ukrainian animal shelter. 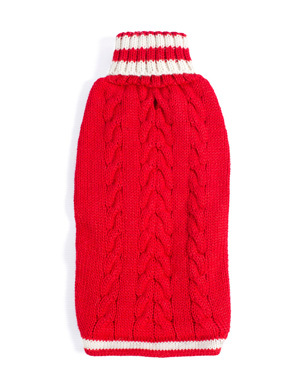 Preppy pups will look adorable in this bright red, cable knit dog sweater with a white stripe collar and cuff. Made in Peru from sustainable Alpaca fibres, yarn that is seven times stronger and three times warmer than merino wool. Containing microscopic air pockets, this dog sweater is as lightweight as it is warm. Not only is it soft to the touch, the added benefit is that Alpaca fibre is naturally hypoallergenic and lanolin free for sensitive dogs, and it does not absorb or retain moisture should the rain start while you are mid-walk. 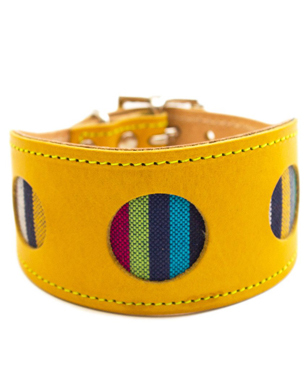 If you like your stripes with some punch, this specialist sighthound collar is just the ticket with a sunny yellow vegetable tanned leather outer and East African vibrant striped fabric, peaking through the circular cut-outs. Handmade in London, the collar is constructed with high quality buckles and solid D rings to withstand tough pullers and the uniquely shaped fishtail designs stops the collar from slipping over the slim heads of the breeds the piece was designed for and protects their delicate windpipes.